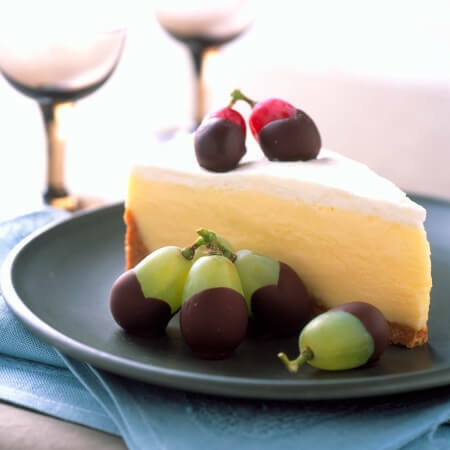 Within this website are ideas and recipes courtesy of the California Table Grape Commission and fellow foodservice professionals. Also included is information about grapes and health, downloadable brochures, recipe cards and more! 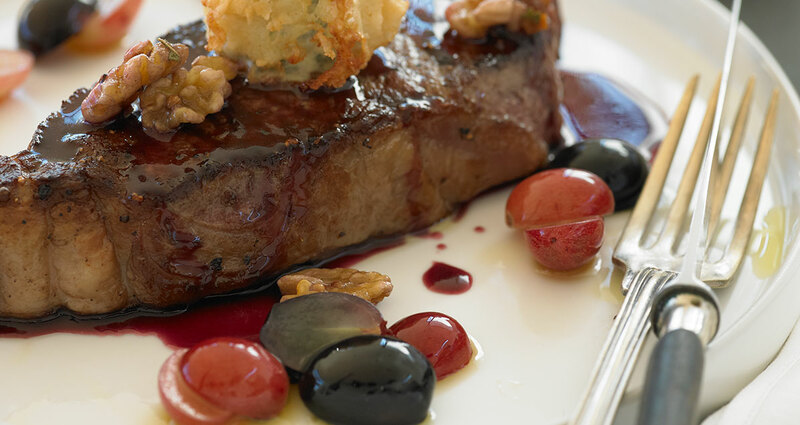 Explore the versatility of grapes with these 21 clever ways to use grapes on menus. From grilling to pickling, to roasting and even smoking them, Grapes from California enliven the menu, elevate the fun, and accent the plate. 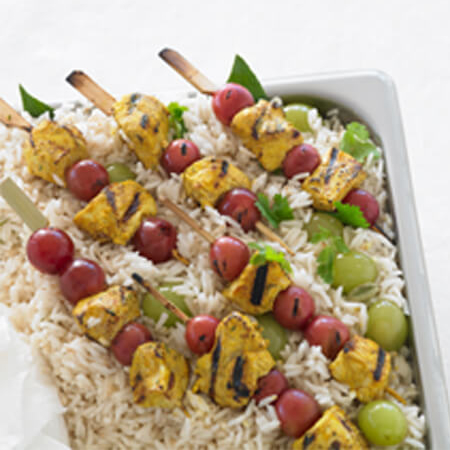 California Grapes Make Healthy Menus Easy! In the current culture of health and wellness, more and more consumers are seeking healthy options. 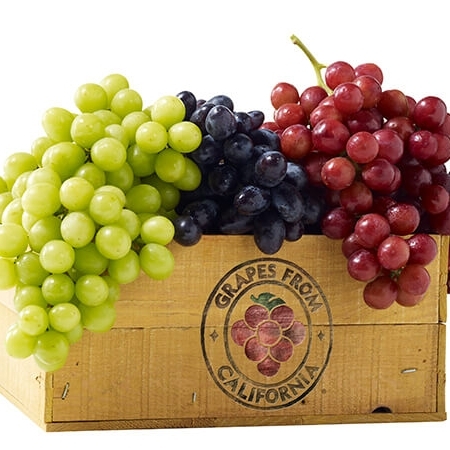 Fresh grapes from California are naturally healthy and can help create “better – for – you” menu offerings. 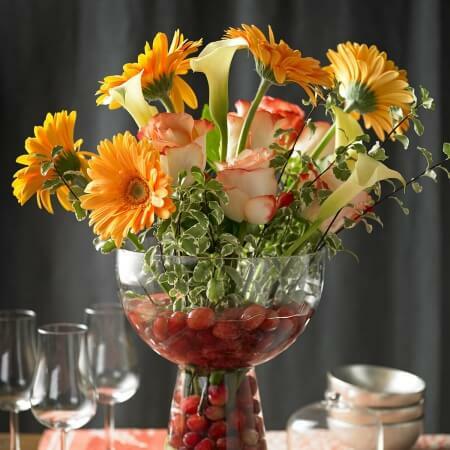 Use Grapes from California instead of glass gems or foam to hold flowers in place in a vase. 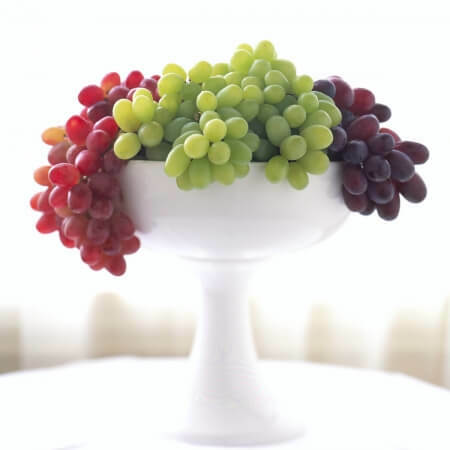 Grapes keep a floral arrangement completely natural and extends color throughout the entire vase. 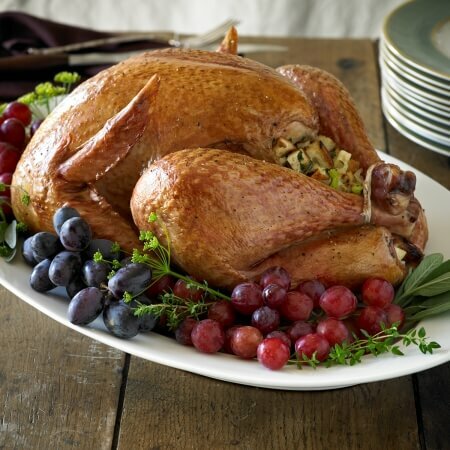 Accent a turkey with beautiful grapes for friends and family to admire… before it’s all gobbled up! After placing the cooked turkey on a large platter, decorate with a variety of fresh herbs and small bunches of grapes from California. The décor will be a delicious sweet treat once served. Click here for turkey stuffing and side dishes. California grapes add color, texture and flavor to dining tables and work well with a wide variety of themes and color palettes. From elegant weddings to festive dinner parties, grapes will be an unexpected and appreciated surprise for guests to nibble while they mingle. No matter the color, California grapes are an excellent addition to floral arrangements, adding color, texture and depth. 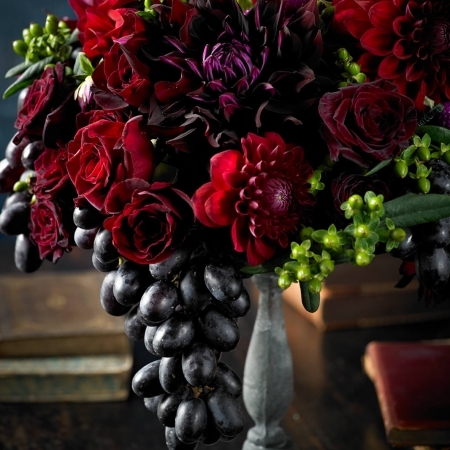 Red, green and black grapes pair perfectly with a wide variety of flowers and greenery. 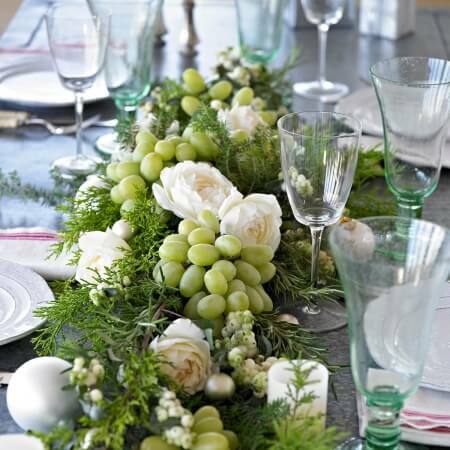 A floral arrangement with grapes is something beautiful to see and delicious to eat! 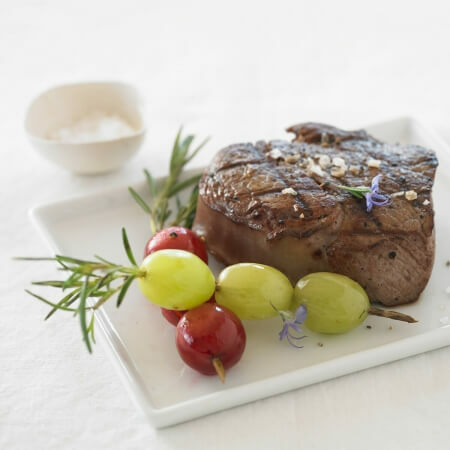 Add color and fragrance to a perfectly seared steak with rosemary grape skewers. Snip long stems of rosemary leaves and remove all but the top leaves from the stem. Insert the stem into several Grapes from California and serve alongside the steak. 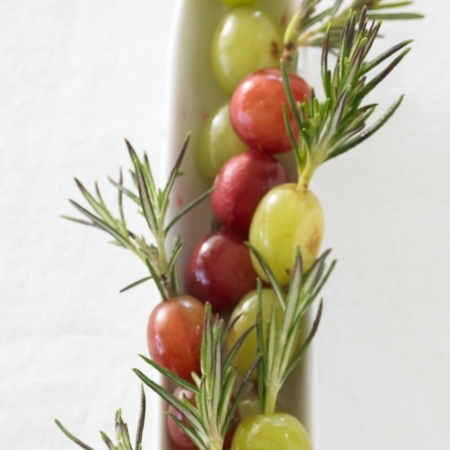 Rosemary grape skewers are also a perfect complement to this Grape Rosemary Martini. 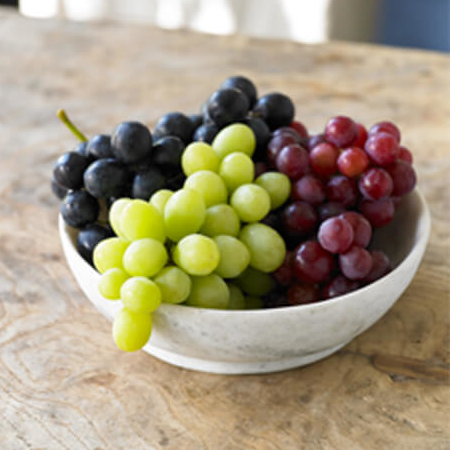 For those days when guests arrive unexpectedly, top a unique platter with just a single bunch of Grapes from California for a simple, striking design element on a table that appears to have been completely planned. Guests will not be able to resist the tempting burst of flavor. A Spanish tradition called “the twelve grapes of luck” dates back to 1895 and consists of eating a grape with each of the twelve bell strikes at midnight on January 1. Many believe this leads to a year of prosperity. 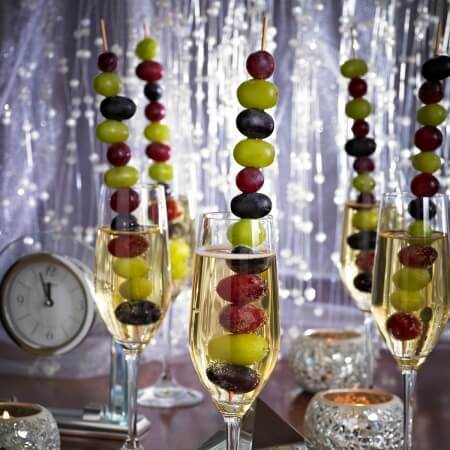 Green, black and red Grapes from California look festive on skewers served in champagne glasses or in punches, sangrias, fruit teas and cocktails. Try this fabulous champagne cocktail recipe. 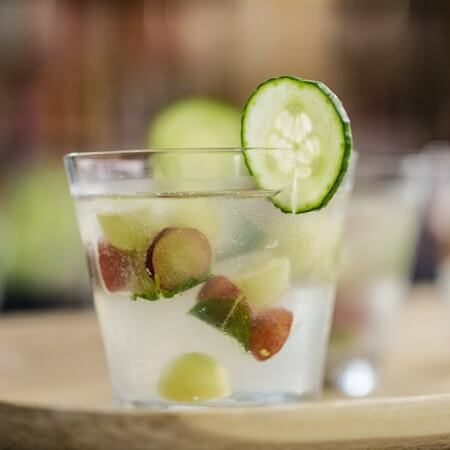 Grapes freeze well and make a perfect replacement to plain ice cubes in cocktails – simply freeze sliced Grapes from California and mint in ice cube trays with a bit of water, then add to a cocktail, like this Gin, Grape and Cucumber Cocktail. 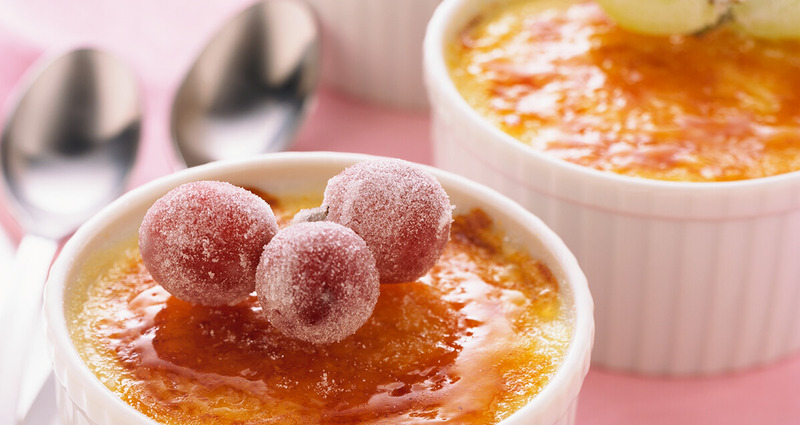 Frosted grapes sparkle with sugar and add an extra-sweet touch to desserts like crème brûlée…or enjoy them as a dessert all on their own. 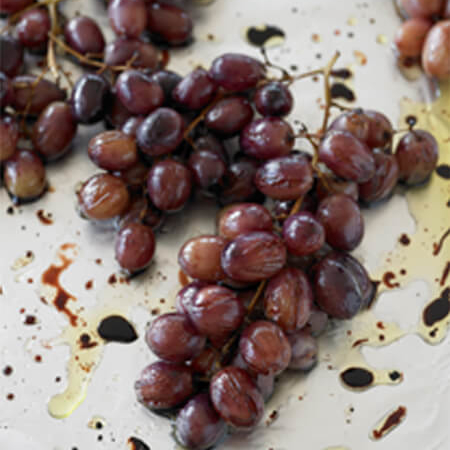 It’s easy to frost green, black and red Grapes from California with this recipe. 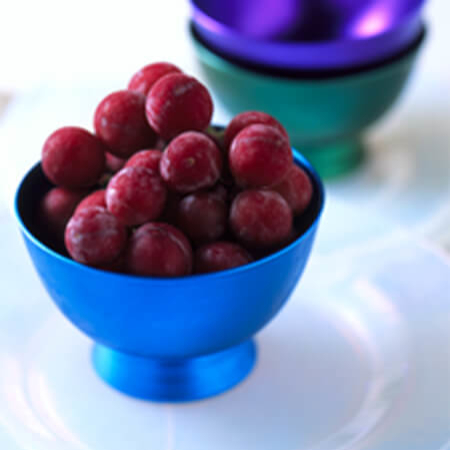 A hollowed piece of citrus makes the perfect cup for grapes while adding color and a fresh scent to the plate. 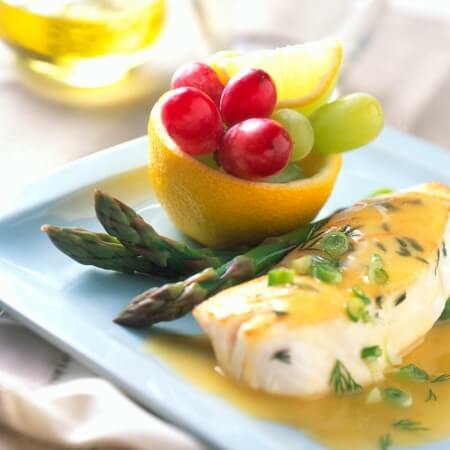 Fill an empty lemon cup with fresh Grapes from California and serve alongside meals featuring ingredients like fish. Dipped in white, milk or dark chocolate, Grapes from California are the perfect match for dipping in chocolate! Enjoy with dessert, like cheesecake, with tea or even just on their own. Green, red and black Grapes from California are easy to dip in chocolate using this recipe. Candles stand taller with extra height from Grapes from California. 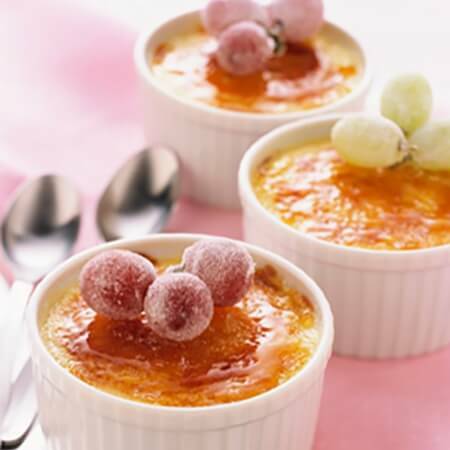 Secure grapes into fresh frosting and allow to set, then push candles into the top of the grape. It’s an extra special touch for a birthday celebration. Try this Grape Spice Cupcake recipe. 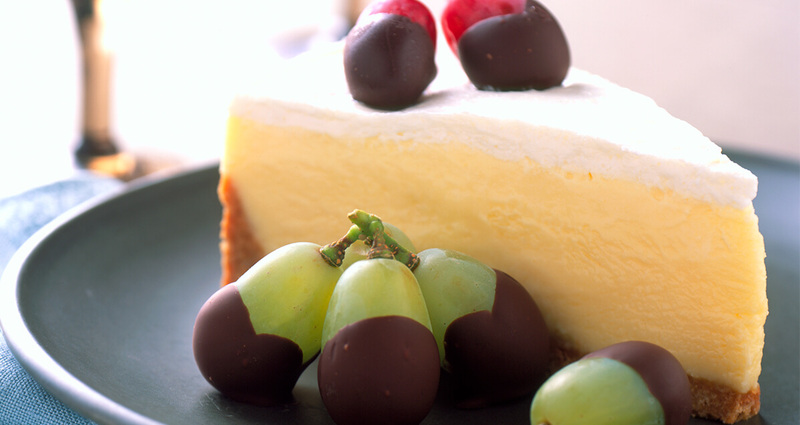 Red, green and black Grapes from California are the perfect décor for a simply-frosted cake. 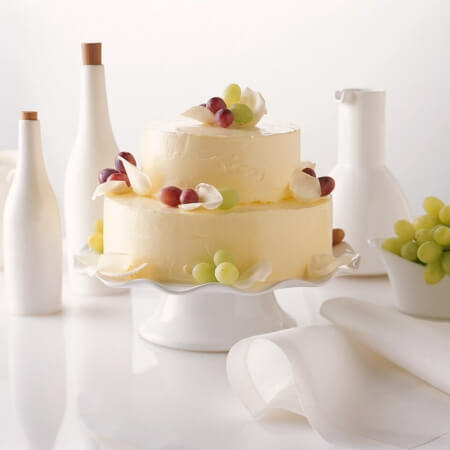 Grapes add color and elegance to each tier and are an edible decoration! 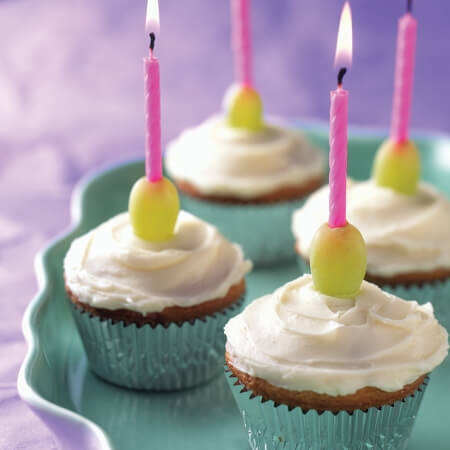 Grapes are also the perfect candle holder on cupcakes, as seen here. 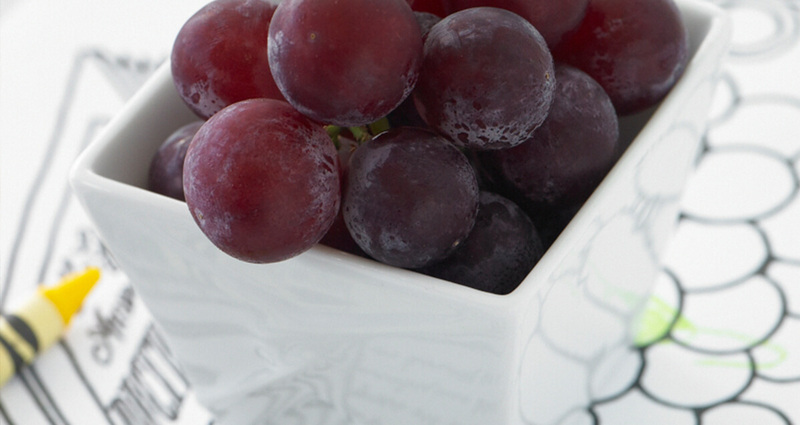 A pedestal of California grape bunches makes a simple, understated look of elegance on tables and counters. Their stunning beauty is shown as they cascade from a tall stand. And this décor couldn’t be easier… with more than 85 varieties, just select preferred bunches and set on the pedestal! 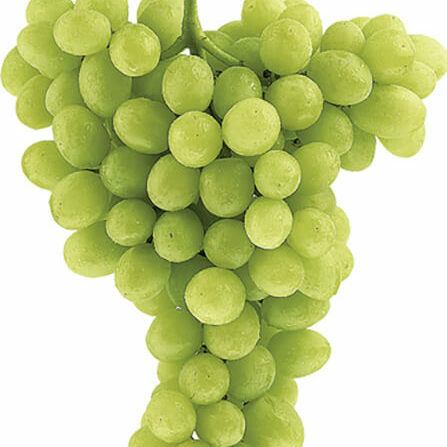 Grapes keep very well – up to two weeks – when stored and handled properly. 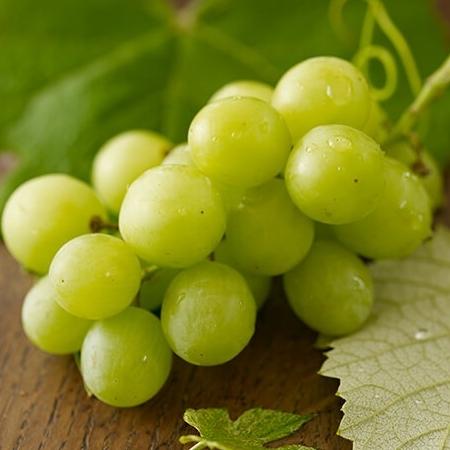 Here are some tips to keep grapes in the best condition possible. 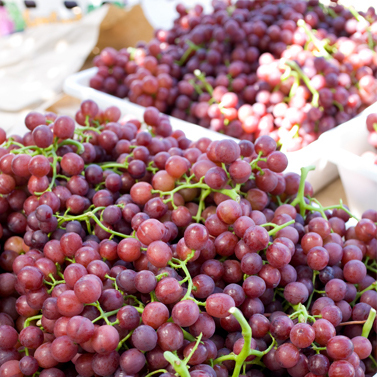 Grapes from California are available nearly year-round, from May through January. The growing season is long, with two grape-growing regions that have hot, dry summers and falls, allowing the vineyards to bask in sunshine that develops full bunches of large, plump and sweet fruit. The harvest starts in the southernmost Coachella Valley and moves northward into the San Joaquin Valley, where grapes can be harvested into December. There are more than 85 varieties of California grapes, each with a personality all its own. Looking for inspiration? Tap into some valuable resources for new ideas featuring fresh Grapes from California. Add a unique signature entrée salad or sandwich with grapes to offerings. Highlight seasonal veggies with a grape accent, such as asparagus with a fresh grape relish. Surprise guests with Fresh Grape Salsa and Black Grape Margaritas in honor of Cinco de Mayo. Capitalize on the classic combination of grapes and seafood: salmon, crab and prawns offer an array of culinary opportunities with grapes. Offer grapes as a fresh side accompaniment to burgers and sandwiches – a refreshing option to french fries and chips. Launch Grab ‘n Go Grapes, packaged for takeout. Click here for tips on merchandising for the greatest impact. Put grapes on the salad bar, either loose as a salad topper or in clusters. 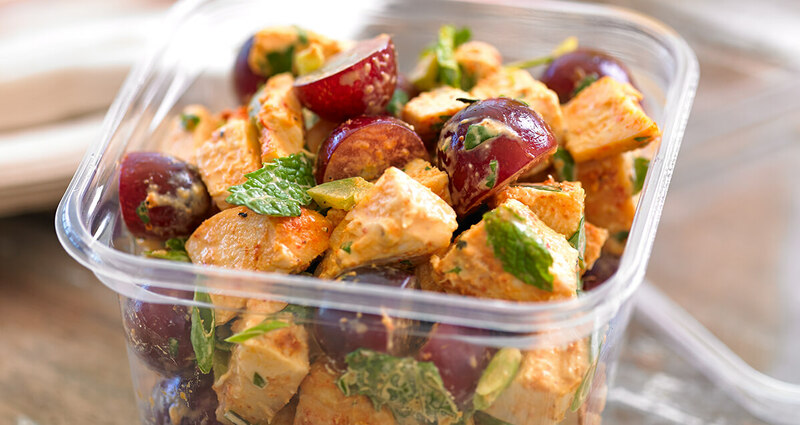 Include grapes as the fresh fruit option for catered boxed lunches. Boost bar tabs with a signature cocktail that features fresh grapes. Fresh grapes on the Kid’s Menu will be popular with both kids and parents. 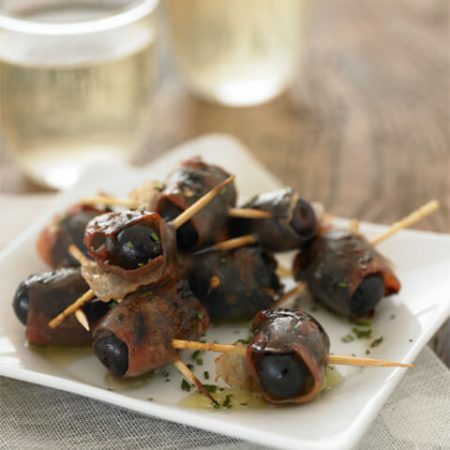 Roasted grapes offer a rich intensity that complements an array of meats and poultry. Click here to get inspired. Innovative appetizers feature the classic combination of grapes and cheese in new ways: perhaps pizzettas with gorgonzola, roasted garlic and grapes or bruschetta topped with smoked chicken, fontina cheese and grapes. 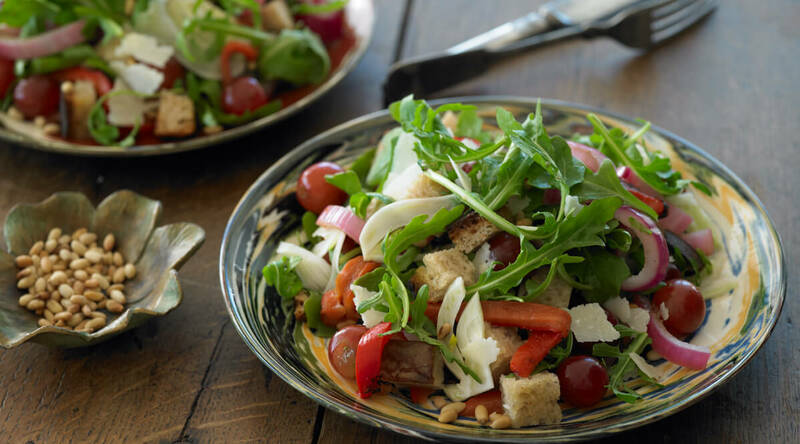 Hearty entrée salads with intense flavors are balanced with grapes in the mix of ingredients. Seasonal side salads are an easy way to incorporate grapes: spinach, pancetta, grapes and shredded parmesan or shaved Brussels sprouts with grapes, fennel and bacon. 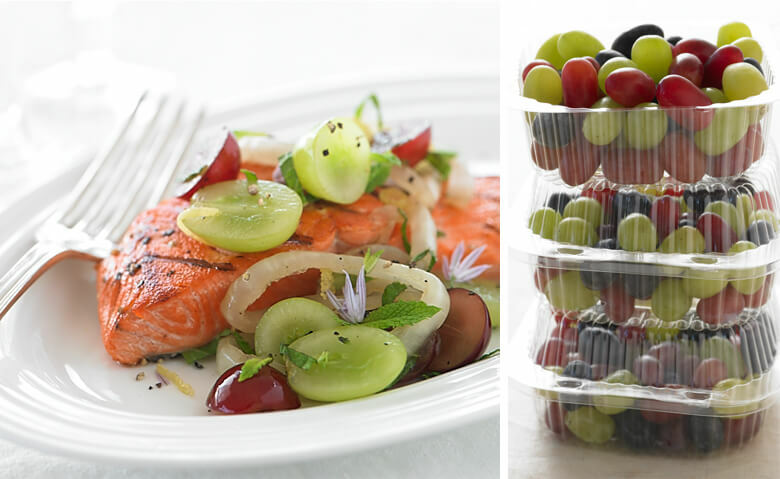 Provide “bountiful harvest” packs of Grab ‘n Go grapes that contain all three colors – green, red and black. Upgrade your sandwich offerings with Smoked Turkey, Cashew and Grape filling, or Tuna Salad with Grapes and Tarragon dressing. Enhance whole grains such as quinoa, farro and wheatberries, with fresh grapes and a signature vinaigrette for delicious and good-for-you salads. 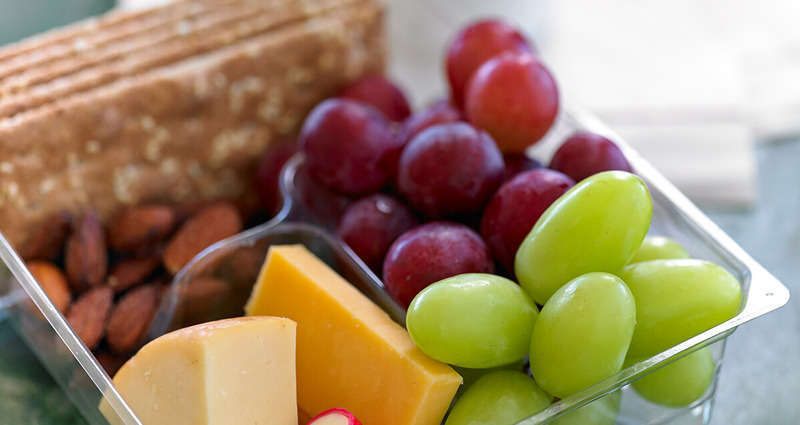 Create snack combos or small plates that feature grapes with cheese and crackers, or hummus and pita chips. Roast robust veggies such as cauliflower or brussels sprouts with grapes for a satisfying combination of flavors and textures. A golden-yellow color of some green grape varieties that have been left to ripen longer on the vine. An antioxidant neutralizes harmful free radicals to help prevent the process of oxidation that damages cells. When free radicals are left to their own devices, a condition called "oxidative stress" occurs. Oxidative stress is now associated with numerous health conditions and chronic illnesses. 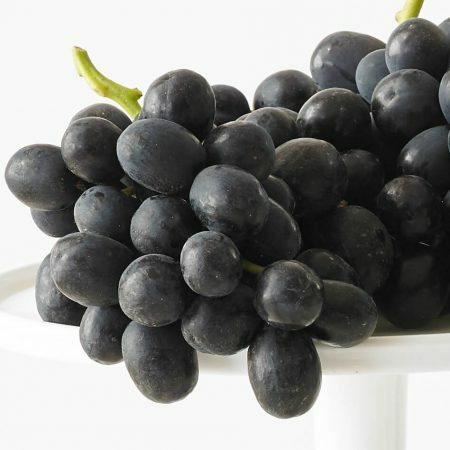 Brix is a measure of soluble solids content in grapes, mostly sugars. Brix is measured with a refractometer and expressed in degrees. Each degree of Brix equals 1 gram of sugar per 100 grams of grape juice. Natural plant components that give a plant its color, taste, and smell and are part of the plant’s self-defense system, protecting it from pests, viruses, bacteria and excessive sunlight. A “family” of plant compounds (phytonutrients) found in grapes that appear to protect the health and function of cells and help promote antioxidant activity. Grapes that contain naturally occurring seeds. 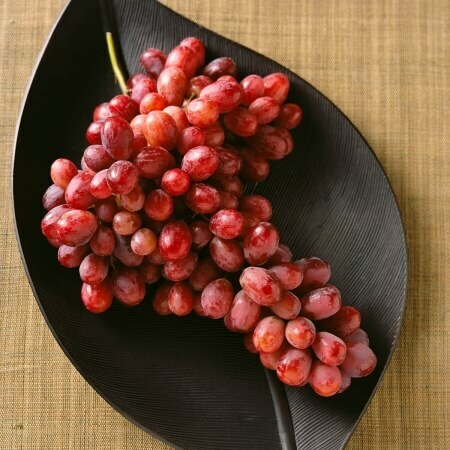 Grapes that do not have seeds. Soft, under-developed portions of a seed in some seedless grapes. Development is related to the weather during early phases of the growing season. Detachment of berries from the cluster is called shatter. Shatter increases with rough or excessive handling and can be reduced by gentle handling and maintaining recommended temperatures and relative humidity.